Hakkenden, or ‘The Eight Dog Chronicles’, was originally a 106-volume epic novel written over 28 years by the writer Takizawa Bakin (1767-1848). Set in the turbulent civil wars of the sixteenth century, it recounts the adventures of eight samurai brothers. 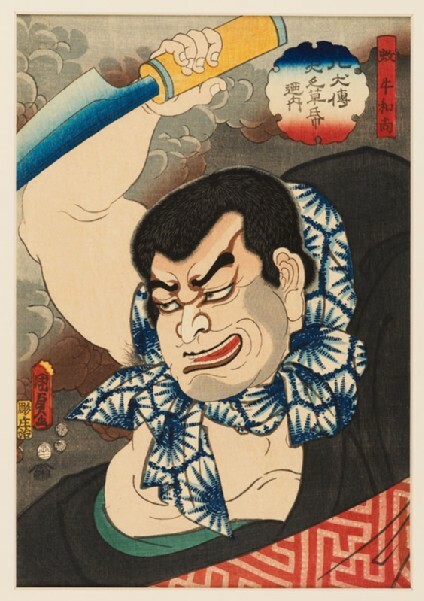 With its strong themes of loyalty and family honour, Confucianism, Buddhism and the warrior code of bushidō, it was first adapted for the kabuki stage in 1834. Kunisada produced a number of prints of this subject.